This page gives details of a number of iDirect hubs that I have put together. If you want details of your hub(s) added please tell me eric@satsig.net There is no charge. These details are to help people wanting iDirect services or iDirect VNO. Lepton Global Solutions is an ISO 9001:2015 certified small business, offering end-to-end satellite communications solutions. We operate a truly global iDirect Evolution satellite network with access to 25+ satellites worldwide, managed from our central Network Operations Centre at the company HQ in Vienna, VA USA. 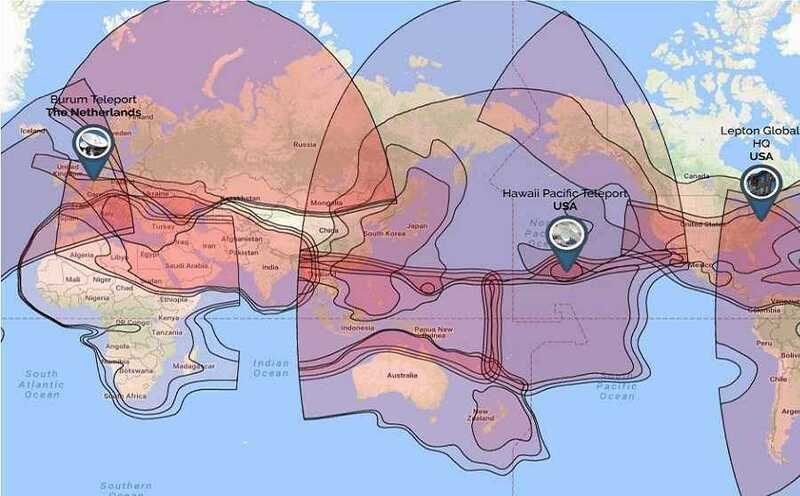 Lepton-owned iDirect hubs at the Hawaii Pacific Teleport in the United States and Burum Teleport in the Netherlands offer worldwide, unlimited-data shared and dedicated TDMA services, satellite backhaul, and VNO connectivity. The new, low cost, iDirect X1 modem has been introduced since April 2012, following the upgrade of all the Bentley Walker hubs to iDirect iDX3.1 which permits this new router to operate with a new 16 channel narrow band receiver card at the hub. In addition to traditional broadband satellite internet access and VoIP, the new router is also well suited to utility networks, remote meter reading and smart meter control, remote control and monitoring, weather stations, SCADA, cash machines, governmental and military. The router is low power and with its DC input option ideal for solar panel/battery operations. The router is available both for indoor use and also in a IP67 weatherproof box for external pole mounting or similar, at unmanned locations. For more details contact: Mohamed El Faisal, Pre-Sales Manager. 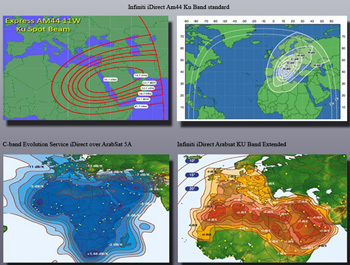 Connect Internet, based in Nigeria, provide an iDirect Evolution X3 service to Africa using the Telstar 11N satellite at 37.5 west orbit position. 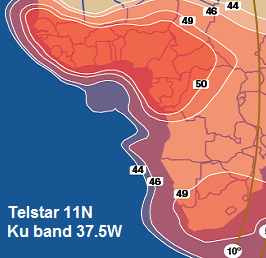 This provides for Ku band operation in the African countries included in the coverage shown by the beam map. Their ConnectX3 is a 2-way VSAT system using iDirect EVOLUTION X3 for unlimited broadband Internet. 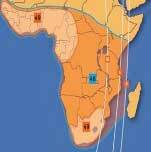 Operated and managed from the Onlime teleport it provided 2-way broadband Internet in West, Central & Southern Africa. 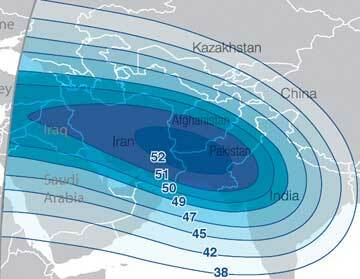 Crescent Communications provides SCPC (Single Channel per Carrier) services over Middle East (Afghanistan, Pakistan, Iraq), North Africa and European Region - a well established and steadfast technology known for its unparalleled reliability, superior bandwidth efficiency & significant flexibility. SCPC Systems is suitable to solve all communication needs of national and international companies. SCPC/DVB-S2 service provides the perfect solutions for businesses with demanding applications, such as VOIP, dedicated data channels and backhaul connectivity. 2011: Crescent Communications FZ LLC (Crescent Communications) has signed an agreement with Asia Broadcast Satellite (ABS) for multiple transponders on ABS-7 to serve the Pakistan, Afghanistan and the Middle East markets for broadcast and IP-based services. ITC Global operates seven strategically located "iDirect Hub" facilities that are used for service delivery to enterprise clients, and has also installed, commissioned and maintains custom designed "managed networks" for a number of clients in Australia, Africa and the Americas. With Offices in Australia, Africa, South America and the US, ITC Global is well positioned to provide world class engineering, competitive procurement and provisioning, and 24 hour monitoring and support to its clients. ITC Global provides satellite networks in Ku-band and C-band frequencies, enabling us to deploy installations worldwide. All major continents and population centres are covered, with many major regions covered in both frequency ranges. The USA teleports enable coverage to North, Central, and South American regions, as well as Europe and Africa from Atlantic Ocean Region satellites. The Australian teleports enable coverage into Africa and Europe, as well as coverage of Asia, the Indian subcontinent, Australia and New Zealand. Hubs in the UK and Austria provide overlapping coverage for bespoke redundancy solutions as well as single hop solutions into Europe. With more than 15 years experience in designing, building, optimizing and supporting satellite based communication networks, ITC Global is a leader with an extensive reference list. ITC Global has significant demonstrated experience in supplying and installing satellite communications systems in remote and difficult offshore locations around the Indian Ocean and Pacific Ocean Regions. Our widespread experience in delivering business critical communications means that we are able to bring to bear world class engineering skills, applications and technical support structures for the design, construction, optimisation and support of the Satellite Systems required by our clients. The ITC Hubs are all DVB-S2 iDirect based. Along with the advanced features of the Evolution series modems and hubs, ITC Global provides an extensive customer NMS portal. This allow customers to access statistics and reports for each site, based on daily, weekly or monthly increments. 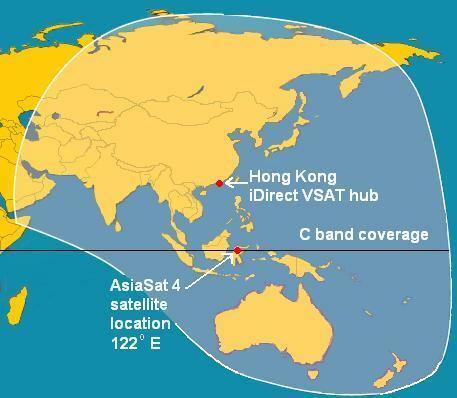 iDirect Satellite broadband for Asia and the Pacific, by Oceanic Broadband Solutions Pty. Ltd.
Orbit Research Ltd have an iDirect Hub, Type 5IF the SMS-Teleport in Rugby, UK. This company and the owners have many years of experience in designing earth stations for some of the biggest telecom companies including Inmarsat, BT and Teleglobe. They specialise in providing satellite internet connectivity for fixed and temporary connections, especially where the requirement is complex or involves company networks. The company is good if you need technologies such as streaming video or audio, WiFi hotspot, high data-rate with low contention. Also, for applications needing low bandwidth (such as monitoring and control of remote assets), they will work out a tariff that reflects the lower resource usage. Orbit Research Ltd have an iDirect Hub, Type 5IF the SMS-Teleport in Rugby, UK. The Orbit iDirect 5IF hub can host VNO (Virtual Network Operator) operations as well as providing connectivity for individual satellite terminals. DigitalSkys have an iDirect hub, located at the Cyprus Telecommunications Authority (CYTA) teleport with direct high speed optical fibre to London. The 5IF iDirect hub has multiple hub antenna capability and is connected to several large hub antennas so that service may be provided on up to five different satellites. From Cyprus, almost 90% of the world may be connected. Service is offered on NewSkies NSS6 and NSS7 satellites, with services aimed at Europe, Middle East, Africa, India, and Australia. NSS6 provides coverage in Ku-Band in the Middle East beam and NSS7 provided Ku band coverage in the Europe - Middle East beam. 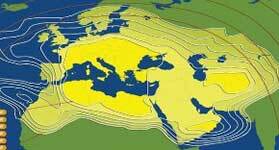 The high power SES Americom AMC12 satellite provides C band coverage of Europe and Africa in the Hemi Beam. All pages on this satsig.net web site are Copyright Satellite Signals Limited (c) 2010 all rights reserved.